Enterokinase is a type 2 transmembrane serine protease produced by cells in the duodenum which are involved in the body's digestive system. It is responsible for the initial activation of pancreatic proteolytic proenzymes that catalyses the conversion of trypsinogen to trypsin.Enterokinase's specificity makes it an ideal tool for biotechnological and biochemical removal of fusion proteins and tags. As a human enzyme, enterokinase is 1019 amino acids in length containing 14 disulfide bonds, 18 potential N-glycosylation sites and a N-myristoyl lipdation site as the N-terminus. Specifically cleaves the bond between Lys23 and lle24 in human trypsin-1 and the equivalent peptide bond in other trypsin family members. Enterokinase's catalytic light chain is 235 amino acids in length and contains 4 disulfide bonds. Enterokinase deficiency is a life threatening intestinal malabsorption disorder. Molecular weight of enterokinase varies from 82 – 140 kD (113 kD protein core) and 35 – 62 kD for its disulfide-linked heavy/chain and light-chain, respectively, depending on the organism. It has minimal requirements for specific amino acids in the P1’ and P4’ positions. Natural substrates have a propensity for Gly or Ser at P3' and/or P4' to ensure regular secondary structure formation does not limit accessibility to cleavage site. This independence makes enterokinase ideal for the removal of fusion proteins and/or tags with the subsequent generation of an authentic N-terminus. Many companies monitor activity by following the cleavage of a protein. The fusion partners used vary widely. The assay conditions employed also vary widely and so, the units of the activity are often defined differently. Paras uses one of the most credible industry standard method for recording the activity of the enzyme. 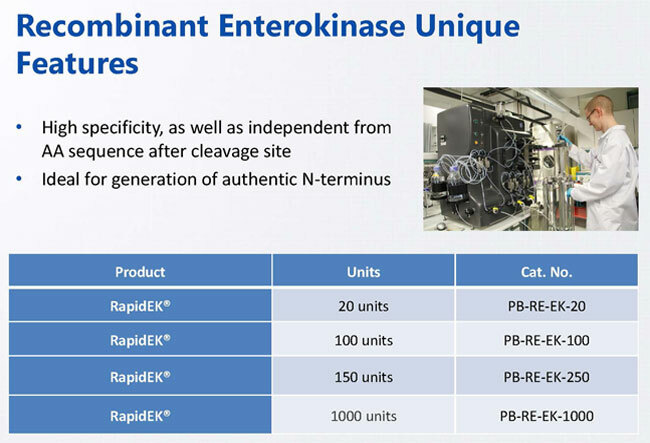 As a type 2 transmembrane serine protease, enterokinase is ideally suited for the biotechnological and biochemical removal of fusion proteins and cleavage of tags after purification. Produced by cells, enterokinase is responsible for initial activation of pancreatic proenzymes that catalyses the conversion of trypsinogen to trypsin. This means enterokinase is a very important enzyme in the biopharma and nutrition industry. TARGET GROUP: Nutrition Industry and for the removal of fusion proteins and tags. PRODUCT PATENT EXPIRY: No patents exist. 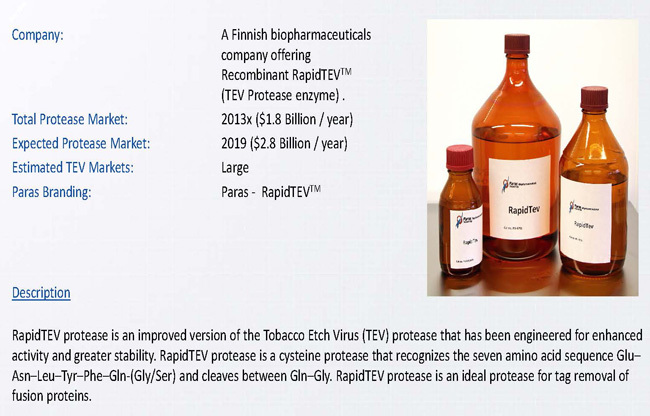 As a member of the cysteine-like family of proteases, RapidTEV® Protease is an improved version of the Tobacco Etch Virus (TEV) protease enzyme. 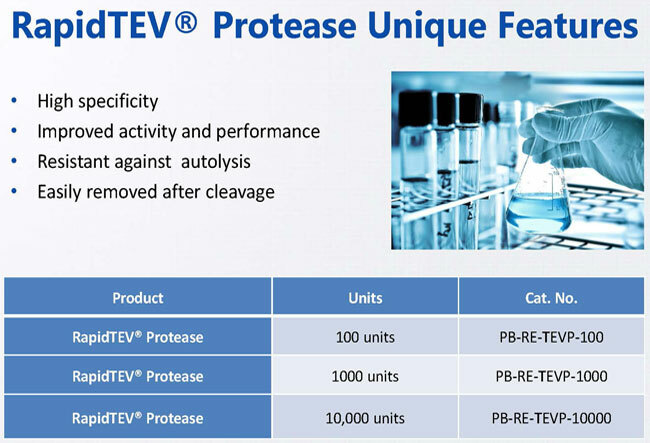 RapidTEV® Protease has been engineered to possess enhanced activity, improved stability and site specificity. RapidTEV® Protease’s specificity makes it an ideal tool for biotechnological and biochemical removal of fusion proteins and tags. RapidTEV® Protease facilitates high specificity cleavage between Gln and Gly (or Ser) of the seven amino acid recognition sequence. 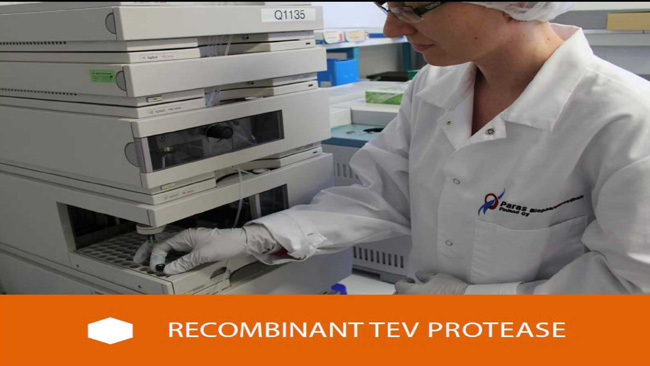 RapidTEV® Protease is extremely useful for removing affinity tags from fusion proteins under target protein friendly conditions. The enzyme is engineered for resistance against autolysis and improved catalytic activity and performance. Due to the presence of a 6X-His tag at the N-Terminus, RapidTEV® Protease can be easily removed after cleavage reaction by affinity chromatography. 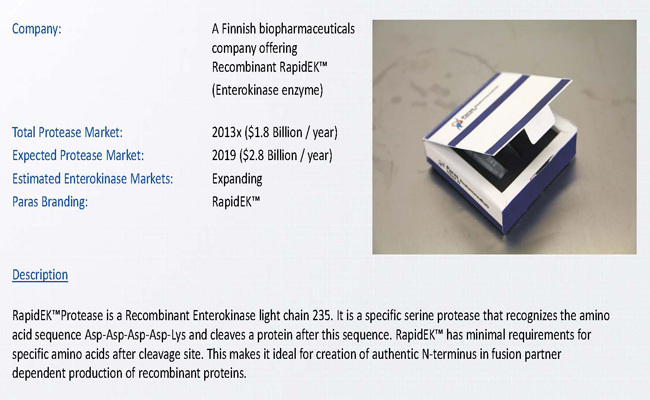 RapidTEV® Protease's specificity makes it an ideal tool within the biotechnology industry and R&D for the biochemical removal of fusion proteins and tags. Due to its sequence specificity, TEV Protease is more stringent and specific than Xa and thrombin. Some metal Ions, for example Zn, have been reported to inhibit the activity of the enzyme at concentrations above 5mM. Most suitable temperature range is 4 - 30ºC. However, TEV Protease is reported to be 2 - 3-fold less active at 40ºC than at 20ºC. Storage is recommended at -20ºC. Resistant to many widely used cysteine and serine protease inhibitors. 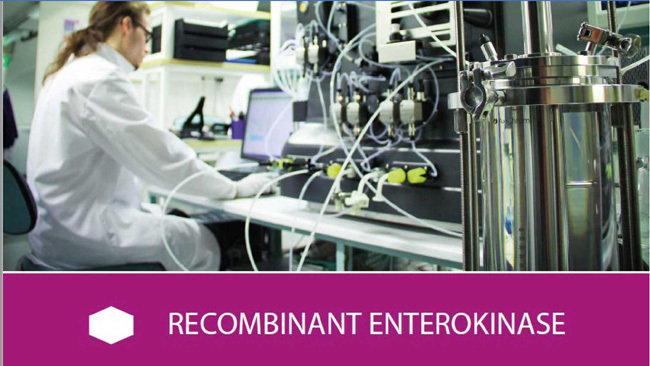 RapidTEV® Protease is active in a wide range of different buffers. RapidTEV® Protease is a site-specific protease that has been engineered for enhanced activity and greater stability. Due to its high specificity it is frequently used for the cleavage of fusion proteins and the removal of tags from recombinant proteins in vitro and in vivo. RapidTEV® Protease is available in various unit sizes.